I’ve read lots of great things about these and my sister uses one and swears by it, so I was excited to find this super cute, travel size one in my Advent Calendar this morning. The FOREO LUNA cleansing brush has a bit of a reputation for being one of the best cleansing brushes in the beauty industry. I currently use a Magnitone and I would highly recommend that cleansing brush too. There are so many available, but it’s really all about finding the best one for you. Using a cleansing brush is guaranteed to give you a brighter, healthier and ultimately more radiant looking complexion. What more could a girl ask for 🙋🏼 I personally struggle with dry skin, especially during the Winter months, but when i’m using a cleansing brush, I instantly notice a difference. There have been days where I’ve gone away with work and forgotten to pack my Magnitone and after just two days of not using it, my skin feels dry and my makeup doesn’t go on smoothly. Use twice a day, morning and evening for a 60 second cleanse. Lightly massage your cleanser into your face using your FOREO LUNA, I find that circular motions or a figure of 8 technique works best when using a pulsating cleansing brush and you don’t have to apply much pressure at all. There are larger touch points at the top of the device for the areas which require more deep cleaning, such as your chin or forehead and smaller touch points at the bottom for the more delicate areas, such as around your eyes. ✔️ It’s entirely silicone, so no need for changing brush heads like with the Magnitone, it’s also more hygienic than brush bristles. ✔️ Great to keep for travelling as it’s small and compact. 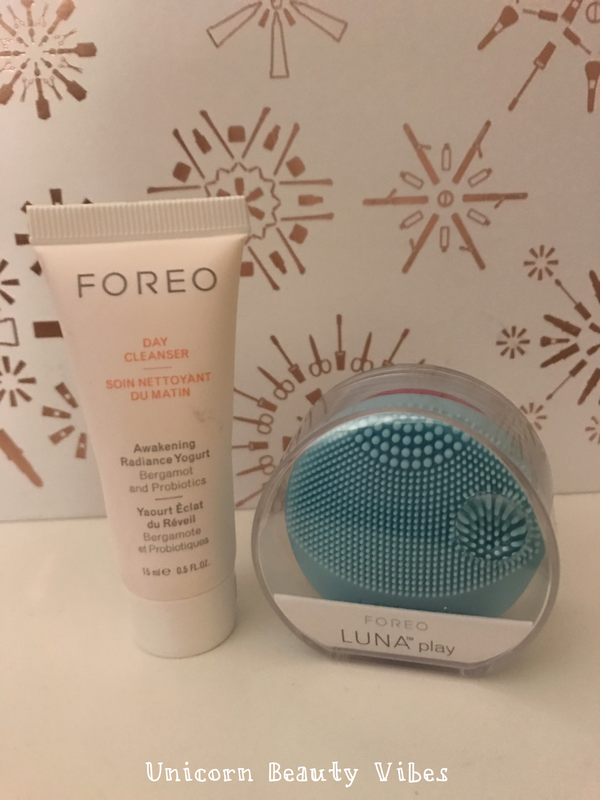 Just one thing to note about the FOREO LUNA Play, it’s technically a beginners sampler… a great idea for a stocking filler this Christmas. It’s designed at a more affordable price of £29.00 for people to try out to see if it’s right for them before investing in a full size model. It’s non-rechargeable, but is expected to last up to 100 uses (approx. 1-2 months when used twice a day). All other models are rechargeable and range in price from £85.00 up to £169.00. Let me know what you think by dropping me a tweet @katiehorsefield or following my daily posts on Instagram.